Call Us Today To Find Out How A Metal Roof Restoration Can Benefit Your Roof! Have you noticed a decrease in the energy efficiency of your building, or obvious signs of wear and tear on your metal roof? Metal roofing is a common selection for commercial & industrial facilities for many reasons. Its durability, longevity, and value as an economic roofing system are just a few benefits. However, metal roofing will struggle with issues at some point – just like all types of roofing do. 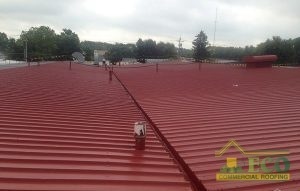 When your metal roof has trouble, call ECO Commercial Roofing. We can provide metal roof restoration in Texas, Louisiana, and Mississippi, and we have 20+ years’ construction expertise and exceptional roofing knowledge. One of our specializations, metal roof coatings will make your aging metal roof function and look as if it were brand new! To learn how roof restorations end leaks and other costly issues on different roof types, call us at (833) 200-0571. A company roof technician will schedule an appointment to conduct a roof evaluation, discuss solutions, and answer questions. Problems will vary from metal roof to metal roof, depending on the type and structure. Nonetheless, many of these issues arise due to metal roofing’s inherent design flaws: seams, screw-holes, roof flashing, exposed locales around penetrations, and other features. Call us when your metal roof is struggling with any problem, and find out how metal roof restoration can save you money! As a forward-thinking company, ECO Commercial Roofing offers a cost-efficient solution for extending roof life: coating restoration systems. When applied, a roof coating system will transform your old metal roof into a cool, energy-saving asset! Our metal roof coating systems are engineered to provide durable, leak-free protection for years to come. Plus these roofing systems pay for themselves via lower energy costs! Fortify your building with our premier coatings, and enjoy strong energy cost savings in the years ahead. You can count on our 20+ years of construction expertise for the solutions you need. Don’t settle for less – call us today for an on-site roof evaluation from one of our professionals! We can help you with metal roof restoration in Texas, Louisiana, and Mississippi, so you can avoid costly replacement services. You can reach us at (833) 200-0571 for all of your roofing requests. We look forward to discussing your needs and how we can be of assistance!